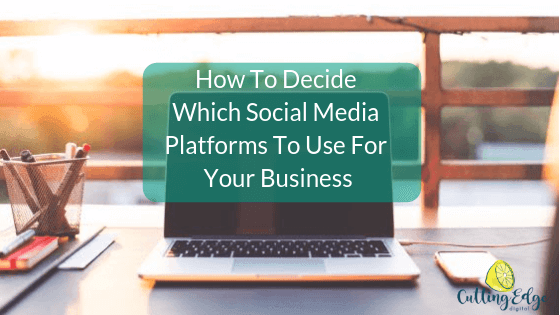 How To Decide Which Social Media Platforms To Use For Your Business? A big thanks to Carma Levene from Carma The Social Chameleon for sharing her tips with us about how to decide which social platforms to use for your business. There are so many social media platforms and only so many hours in the day! And if you’re a business owner, marketing is only one task on a to-do list that some days seems insurmountable. So how do you choose where to focus your time and effort when it comes to social media? The short answer is you need to be where your audience is and maintain your efforts there. But the long answer is a bit more complicated. Each social media platform has its own dominant demographics, so if you know who your customers are, you can make some informed decisions about which platforms they will spend their time on, allowing you to concentrate your effort where it’ll have the highest chance of success. Facebook is used by almost everyone. There are more than 2.23 billion monthly active users, so there’s a good chance your target audience is there. There’s no wonder many businesses maintain a presence on Facebook. Facebook is fairly easy to navigate and allows for many different content types which makes it another reason it’s a popular choice with social brands. The gender split on Facebook is almost even between males and females, and the dominant age group is 18-29, including a high instance of people who are college educated. Sprout Social (a social media monitoring and scheduling tool) produced some helpful stats you can also see here. There are however statistics that show that Facebook is declining in popularity with a younger audience, so if your business relies on reaching teenagers you may need to re-think your strategy to either include another platform or focus your energy on YouTube, Snapchat or Instagram. Instagram (owned by Facebook) is hot right now and shows it’s might as a fairly new player with 1 billion users worldwide. Since it’s addition of Stories and a constantly updating set of features keeping users engaged, it’s an excellent choice for savvy brands who produce visually attractive content. But it’s all about the visuals! Although 80% of Instagram users follow at least one brand If your brand can’t produce attractive images or video it’s not going to work for you. Instagram, if executed correctly, will help your business reach a young, urban audience who are receptive to finding out about new products and brands. It’s predominantly female (38% from 64% gender defined – you don’t have to determine your gender on Instagram) audience scroll to be inspired by beautiful creative and uplifting stories. Snapchat is in decline, but it still has 188 million daily active users worldwide. Snapchat users share “snaps” that disappear, making it a fun way for young people to engage with each other without the pressure to present the perfect filtered faces like what would be expected on Instagram. It’s a bit of silly fun, and brand who can take this type of approach and are looking to engage a young audience should check it out. If your business can’t portray a sense of humour or isn’t looking for attention from young people it’s not worth your time and energy. YouTube is MASSIVE. Ok, not as big as Facebook, but still HUGE, with 1.8 billion monthly active users. But isn’t a platform you decide to use for your brand based on their audience. Your brand should consider YouTube only if you’re committed to producing engaging video content consistently. If you don’t have the desire or the means to do this in your business, give YouTube a hard pass. Let’s be clear, I’m not saying you have to spend a fortune on TV quality production or buying the latest video gear…in many cases the opposite is true, but you must be willing to get in front of the camera (or have someone from your business do so) on a regular basis to publish content that is useful to your target market. YouTube is one of the first places we go to learn a new skill, so if you have a service-based business you might want to consider filming tutorials to help position your brand as an authority in your niche. Ah, Twitter…what was once a favourite for content distribution and quick-response customer service is now relegated to journalists and celebrities. While it’s still a good place to follow breaking news (or president Trump) if your target market are within Australia I’d choose another channel. You can check the audience overview by Sprout Social here if you still think Twitter could be right for your brand. If you’re not familiar with Pinterest it’s like a virtual scrapbook where users “pin” images of things they like to “boards” and it can be a very effective way to drive traffic to your site – depending on your business. Pinterest is very visual and completely female-skewed, with popular topics including recipes, craft, art, fashion, travel, fitness and weddings. If this suits your targeting it’s worth testing to see if you can entice its users to your website, and the good news is it’s not very complicated or time-consuming to maintain a presence there. LinkedIn isn’t the stuffy old “digital CV” of days gone by! It’s experiencing a modernisation in both the way it works and the way people are interacting on the platform. LinkedIn is mainly used by more affluent men than seen in other Social Media channels – so if that’s who you’re looking for, get your profile optimised and start connecting! LinkedIn posts often get a very high engagement rate compared to other Social Media channels, and the introduction of hashtags, video, and topics you can follow make it a very powerful place for personal branding. Having said that, LinkedIn business pages will need to lift their game before they’re worth the effort, with limited functionality and little to no organic reach. Knowing who’s spending time on which channels can help you decide which ones are worth your time and energy as a busy business owner – but how many should you have? If you’re just starting out or re-concentrating your efforts I’d suggest one to start with. Get used to creating or curating content, posting, interacting and updating regularly and measure your results. This way it’s not as overwhelming and won’t take over your entire day trying to juggle too many. Once you’re a bit more confident, and you’ve had some time to test what type of content works for your audience, you can start to branch out and choose another appropriate channel to engage your target market. Once you add another channel, it may be more efficient for you to use a social media tool to help streamline your activity or hire someone to help you such as a Virtual Assistant. But whatever you do, make sure you always check your metrics! Your audience will guide you in regards to the content that resonates with them by interacting with it. Test and refine your content, posting times, and creative so you can determine what’s working and do more of that!